These creamy garlic mashed potatoes are so good, you can serve them plain—no butter or gravy is needed. 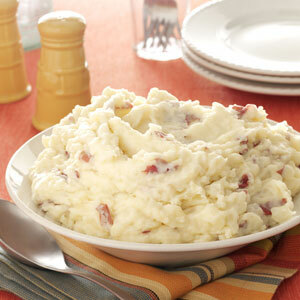 This is the only way we prepare mashed potatoes. Place potatoes and garlic in a large saucepan; cover with water. Bring to a boil. Reduce heat; cover and simmer for 15-20 minutes or until potatoes are very tender. Drain well. Add the butter, milk and salt; mash. Stir in cheese. Yield: 6 servings.